Interior painting should be more than just a wall covering, it should be a tool to create mood in your home. Think of your favorite color and what comes to mind? Red may bring to mind love and roses or a flame of a warm fire. Yellow might invoke a sunny day, blue a pristine lake and green a tranquil woods. All of these images bring about an emotion. 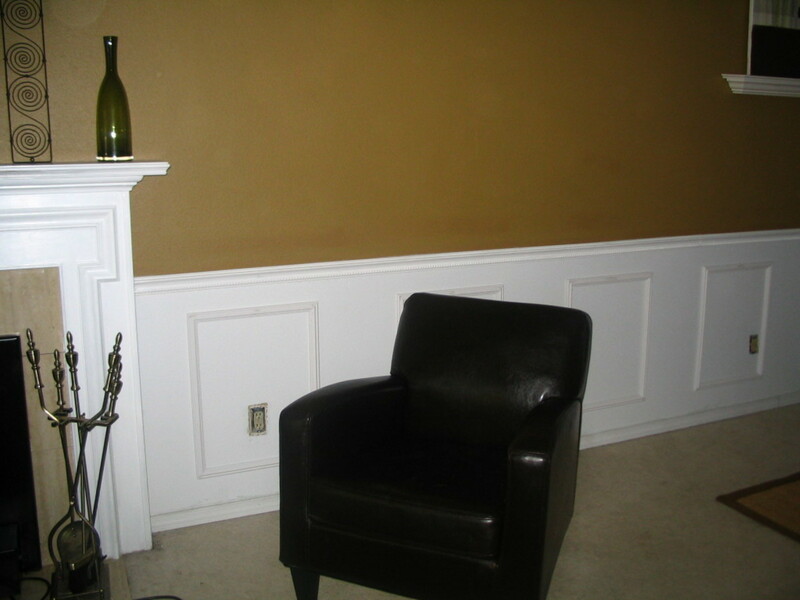 Wall color can greatly affect mood and therefore should be given serious consideration in your home remodeling project. Since color has such an impact on mood, it's important that we surround ourselves with the colors that soothe or perhaps enliven us, depending on the setting. A bedroom is obviously a restful place where you want soothing, tranquil colors. Blue is a perfect example. A soft blue is reminiscent of the sky and water, both naturally relaxing elements. Green is another color found in nature and again very soothing. Although a lime green holds too much yellow and would be too vibrant for a bedroom, a better choice for an active kid's playroom. Instead of painting a neutral white or cream on the wall, you would be surprised at how versatile a color like flax is. With just a hint of yellow, it adds warmth and happiness. It's amazing how just that little bit of yellow can affect mood. I find it similar to the feeling you get on a sunny day. A little bit goes a long way though. 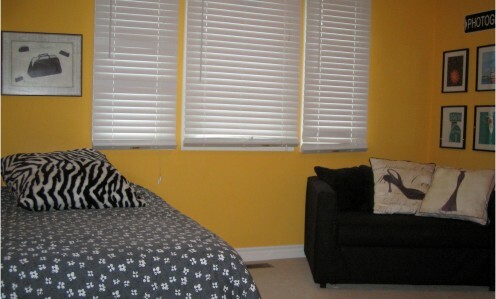 Too much yellow in a color can be overstimulating, you don't want to have to wear sunglasses in the house! This color works especially well if you don't have a lot of natural light. A soft khaki is another great neutral that adds warmth. For areas where natural light is in abundance, cooler colors in the taupe or gray family work well. All of these can be just as versatile as white and cream but since they aren't as stark, they tend to be more soothing. There are times, however, when white is a perfect choice for a bedroom. A shabby chic style white bedroom with lots of texture is a wonderful example. Other times using white on the walls gives you the exact mood or feel that you want. An all white bathroom with a striking accent color shouts clean and antiseptic. While others may prefer soothing earth tones for a more spa like atmosphere. Red is a very stimulating paint color and when used in the right room, like a dining room, can have a very dramatic affect. Shades of burgundy also add drama and are less stimulating. Burgundy can actually be quite soothing. This is a great color for a family room. Basically, bright colors with more red and yellow in them are going to be more stimulating where toned down, muted shades are going to be soothing. You can find any color that you like at each end of the brightness spectrum. So even though a red dining room might be nice, for instance, a fire engine red would just be too shocking! Something like a shy cherry or a red that has blue undertones may be more soothing. Compare red paint chips against each other and you will see the differences. The undertones will stand out. Regardless of what color you choose, it should reflect who you are and the mood you want to create. Why not transform your home into a zesty nest! Nothing adds more warmth to a room than bold color. Try that for a little zest! 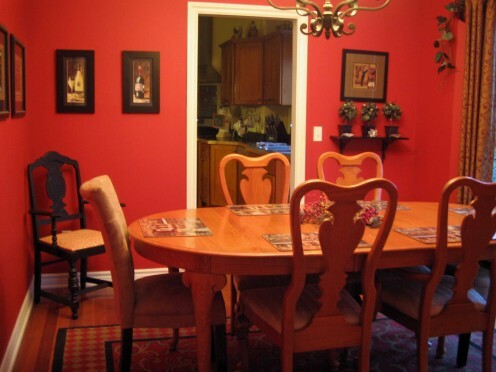 Dare to go bold - I always wanted a red dining room. Since red is my favorite color, I just had to have it in my house. Not only does red enhance the appetite but it also invokes some lively conversation. Mealtime with my family is my favorite time of the day and a bold, happy color to surround us just elevates the mood even more. I see a lot of neutral colors on walls. Sometimes it is because the homeowners like neutral and that makes them happy. If this is the case, then great! There are a lot of options with neutral walls. Too often though, I hear that walls are being kept neutral for resale value or that it is just too scary to put a bold color on the wall. It's a shame to not be living joyously with a color you love. 1. Tape several paint swatches to the wall. They are very small but you can get an idea. 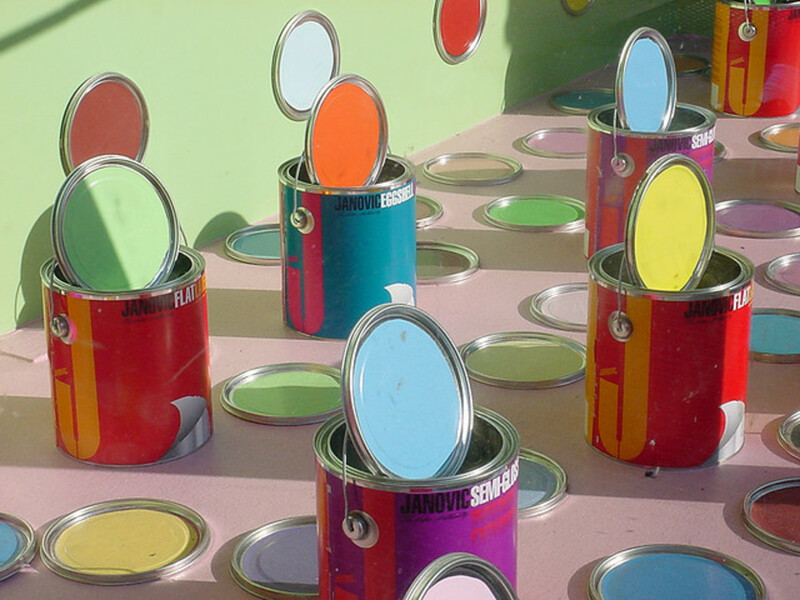 *If you have something in the room that you want to match paint to, the job is easier. 2. 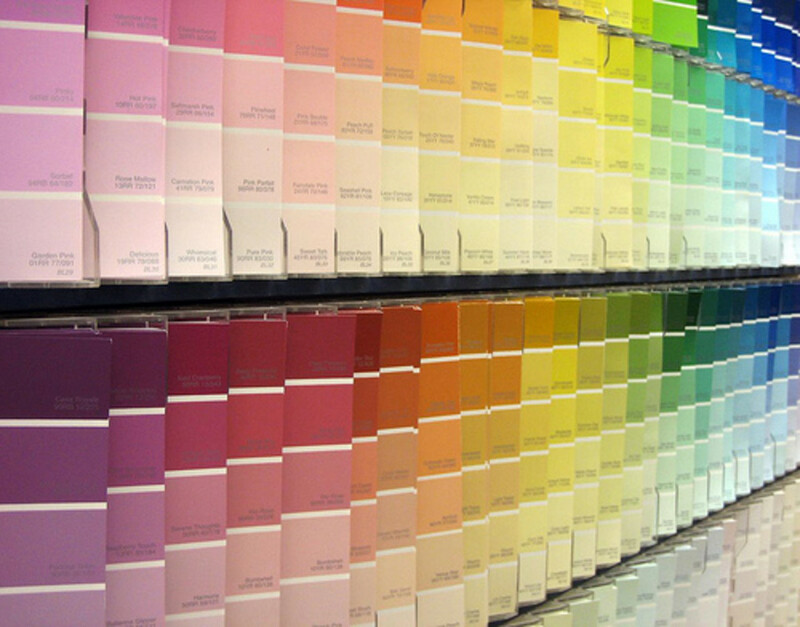 Once you have it down to one or two colors, buy just a small amount of paint in each color. 3. Paint a few coats on a poster board and tape it to the wall. This will give you a much better idea on how the whole wall will look. 4. When you are satisfied with a color, just take the plunge. Chances are you won't be disappointed. If, even after all the testing, you end up hating the color, you can always paint back over it. I hear that Kilz is a great product for painting over dark walls. Luckily, wall paint is terribly expensive. If you are taking on a whole house though, you may want to consider a home improvement loan or even an equity line of credit to help cover the expenses. The investment you make today, will improve the quality of your surroundings for years to come. Accent bold colors with black and white. Nothing makes a color pop more than framing it in black and white. You can do this by simply accessorizing the room in these basic colors. Black and white are easy to come by and with a bold colored wall as a background, the room has sudden drama. Placing black and white pictures on a colorful backdrop is also a simple design solution. Don't be afraid to go dark even in small spaces. 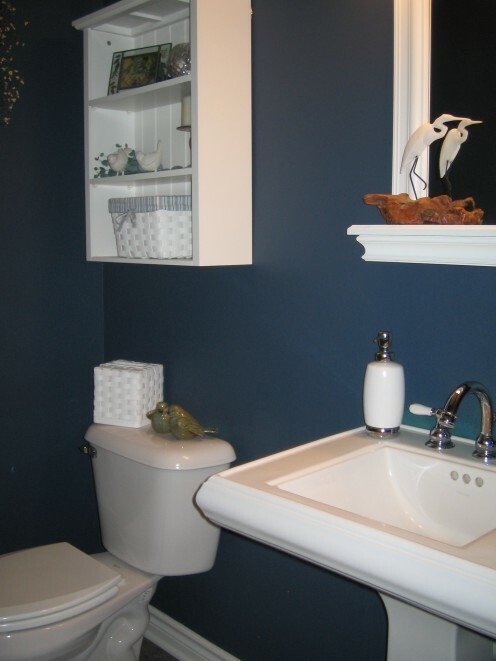 A dark navy wall in a powder room can really make the white fixtures pop. The blue is still a calming color even in the darkest hue. As long as you get some light coming into the room, you won't feel like you are walking into a cave. The bright white accents add just enough brightness to make it a perfect combination. You may have to paint a few coats to get the shade right on the wall when going with a dark color. It's a good idea to start with a tinted primer. If you don't want to do every wall in a room a bold color, you can pick just one or two walls. This could be all the color you need and still bring drama to a room. Just looking at the pictures and then at the color meanings, you can see that they do relate to each other. The blue room does look serene and icy whereas the yellow room looks soothing and happy, each is pleasant in its own way. The bedroom looks rich and down to earth, making it a restful environment. Flat Enamel: A durable flat matte finish that hides imperfections. It is harder to clean because it can leave a mark on the wall if you are not careful. However, it will hold up to occasional cleaning. 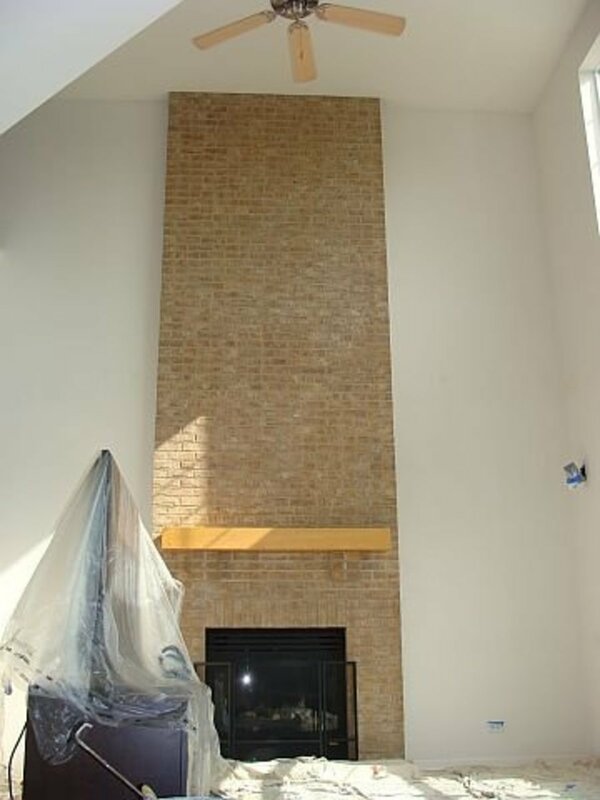 Eggshell Finish: This is a good choice for walls. It has a low sheen like the shell of an egg, still hiding wall imperfections - although not as well as a flat finish. A little more wall preparation though and this is an excellent choice. Cleaning is easier than with a flat finish. Satin Finish: The paint contains a bit more gloss giving a smooth, velvety look. It is most often used for windows, doors and trim but can also be used on walls. Kids rooms, bathrooms and kitchens would all be good places to use it since it holds up very well to cleaning and light scrubbing. Semi Gloss: This one again is used most often on doors, trim and cabinets. It is very easily cleaned and has subtle shine. If using on a wall, the wall would have to be prepared perfectly since this finish is highly reflective and would show every imperfection. 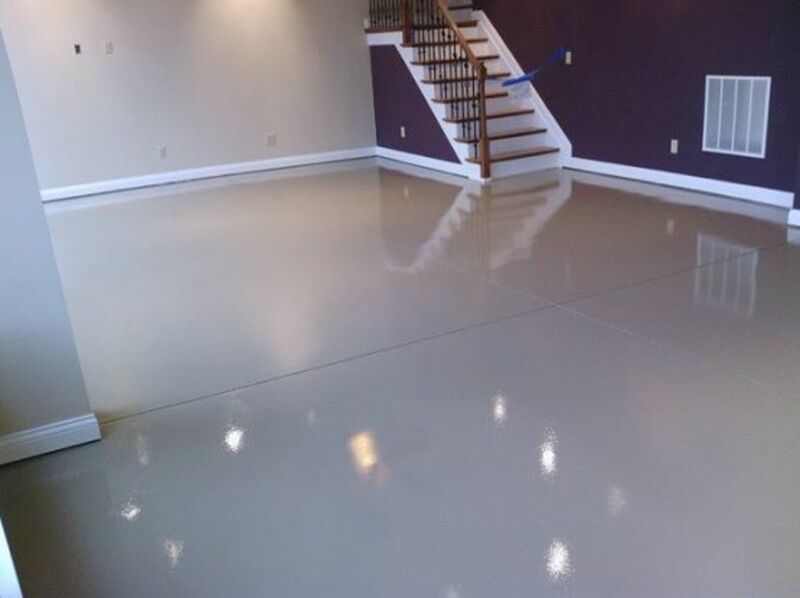 Glossy: Very highly reflective and not used on walls. This finish is generally used on cabinets of furniture. Now that you know what paint colors to put on your walls and you have decided on your paint finish, you may want to know how to actually paint a wall. 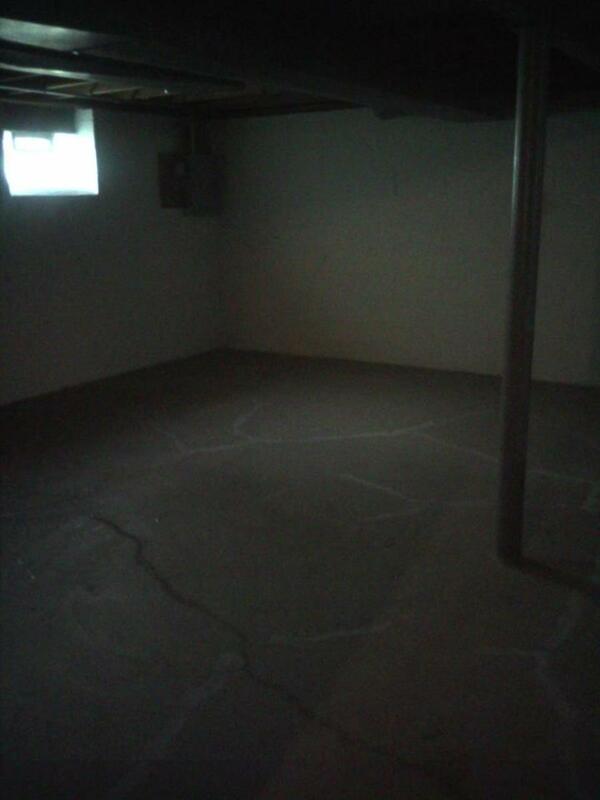 It may seem like an overwhelming project that you may even want to hire out. But before making that decision, watch the following video with step by step instructions. You might find out that it is something you can tackle. Whether you are looking for log cabin décor or a rustic setting, guests will appreciate a cozy lodge ambience. Whether serving coffee or something a bit more lively, this bar begs you to come sit and stay awhile. Tips for decorating kids rooms when they become teenagers. A bedroom makeover is made easy with these teen friendly decorating ideas. It can be mind boggling when you are building a house and you have so many decisions to make. All of your interior design ideas such as wall paint and flooring should be kept in a notebook. Thank you for your hub, I really enjoyed reading it! WOnderful hub! I recently painted my room with yellow and it looks like I'm directly under the sun. I love the liveliness feeling it gives but my partner seems disagree. It's seems to produce heat to him. However, you always have your right to choose.